While I am a Latin Catholic (and somewhat proud of that heritage), I also feel a deep calling to the East; in fact I very nearly became Orthodox. However a Melkite Greek priest aided me in showing me why I need to be Catholic and not Orthodox (he himself formerly an Orthodox priest). Even still, he has always stressed to me that Byzantine Catholics are truly "Eastern Orthodox Christians in communion with Rome." Because of the fatherly influence this priest has had in my life, I have taken up that belief and I have found support of it in the words of the Melkite Greek Patriarch of Antioch. However, I am not quite sure that I truly understand what that aphorism actually means. From my own serious consideration of Orthodoxy, I found many beliefs which I still believe are not compatible with Catholic teachings. I am going to ask my mentor-priest tommorow what he means when he says that he is an "Orthodox in communion with Rome." However until then I wanted to ask the Byzantine Catholics (or any Oriental Catholics) why they believe, if they do, that they are Orthodox in communion with Rome; and what this affirmation means. 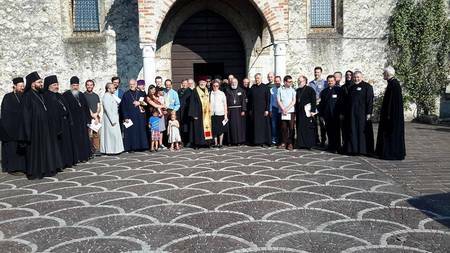 "Orthodox in communion with the Rome" affirms that the Eastern Catholic Church is autonomous and it's liturgical, spiritual, and theological practice are Orthodox according to Holy Tradition of the Byzantine Church. However, they also remain loyal and in communion with the Bishop of Rome - The Pope. I like to think that Eastern Catholics reflect what Eastern Christians were prior to the unfortunate schism. One (indivisible) Holy (mystical) Catholic (universal) and Apostolic (Christ-given) Church (authority or validity) of the Orthodox (true) Faith (belief or expression) in (sharing) Communion (fellowship) with (mutually agreed) Rome (final determination in disputes). Enough of this already! Nobody who is "Orthodox" is in communion with Rome. Period. 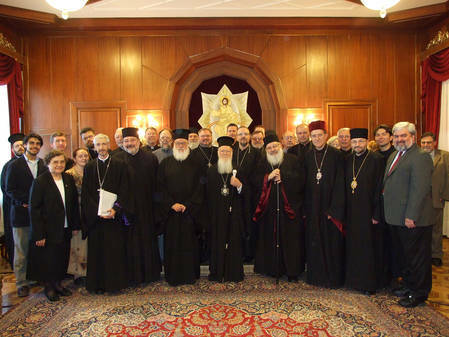 The words Catholic and Orthodox have been tossed around by both sides, but the fact remains that the term "Orthodox" as it's properly used applies to those Christians who follow the Byzantine rite who are in full communion with their Patriarchs or Metropolitans who are not in communion with Rome. The word "Catholic" as it's properly used applies to any Christian, Latin rite or Byzantine rite who is in communion with Rome. Sorry to sound so harsh, but this is how it is. Byzantine Catholics have no business using the term Orthodox, (those that do use it in their liturgies are probably causing confusion among their faithful) as they are Catholics, Period. Until the day that full communion is restored, these two terms mean two different things. Let's all pray for that day, but let's be realistic in the meantime. What you say is factually incorrect. Oriental Orthodox do not follow the Byzantine Rite and are fully Orthodox. And what of Western Orthodox in communion with You - Are they not Orthodox? If Byzantine Catholics "have no business using the term 'Orthodox'", will you from today onwards profess belief in the "One, Holy, Orthodox, and Apostolic Church"? As you professed the Creed last week, were you "confused" by the word "Catholic"? If Byzantine Catholics "have no business using the term 'Orthodox'", will you from today onwards profess belief in the "One, Holy, Orthodox, and Apostolic Church"? As you professed the Creed last week, were you "confused" by the word "Catholic"? It would be far better for each Church to affirm the others Orthodoxy and Catholicity and then work towards full communion. Michael and Ryan, although Etnik may be wrong on who he assigns the term Orthodox to (there are other eastern and western Churches who use the term in addition to Byzantine based churches), many members of the EOC that I know would make the argument that Orthodox/orthodox means the same thing and should only be used in relation to those churches that are in union with Constantinople or her sister churches. These same folks would say there is a difference between the word Catholic and the word catholic. The former refers to the RCC, whereas the latter simply means universal and is used in the Nicaean Creed. You may not like this set of definitions and may think it self-serving, but it is one school of thought and many members of the EOC buy it. Call it bias if you want. Last edited by johnzonaras; 08/31/08 02:58 PM. Remember all Byzantine Christians are Westerners to us. What is being proposed, the term Catholic is in reference to the Church and is inclusive while Orthodox is not in reference to the Faith or expression but affiliation and is exclusive? Besides affiliation what makes “Greco Catholics” Westerners and not Easterners; resisting Slavophil chauvinism? Specifics please rather than general accusations. Often enough - in fact, far too often - I have been faced with, well, I don't want to say "bigots" or "historically ignorant", so let's just say "people who do not wish to understand" who are Eastern Orthodox and who insist that "Papists" are not Catholics at all. I have also been faced with Catholics who insist that "Oriental schismatics" or "Greek dissidents" are not Orthodox at all. But it is more than time that we got beyond this nonsense. Catholic is a term which has been in use among the Eastern Orthodox since long before the schism, and remains so. Similarly, Orthodox is a term which has been in use among the Catholics for many centuries, and remains in use. That is how it is - please do not blame me; I did not invent either of these words, nor did I make some sort of wicked scheme to trick anyone into using either word. Is it really so difficult to accept the simple idea that these words unite us rather than dividing us? We are, for example, "Evangelicals" - we share, read, and believe in the Gospels. And so on. There are issues which are more interesting and more substantial then worrying about such words (neither of which comes from Scripture, incidentally). Maybe we could all argue endlessly about life on Mars. I want to make it clear I am nor arguing with any one. I used the term bias when I described the definitions under discussion. Father Serge notes, "Catholic is a term which has been in use among the Eastern Orthodox since long before the schism, and remains so. Similarly, Orthodox is a term which has been in use among the Catholics for many centuries, and remains in use"
His comments are on the mark. It's interesting to me that the most ancient anaphora used in the Latin Church--the Roman Canon--mentions in the Latin "all orthodox and Catholic . . ." I've seen it rendered in an old tranalation "all those of the orthodox and Catholic and Apostolic Faith" in drawing together all those for whom the sacrifice is being offered. In this context, it seems to me that the fact that we exclude each other, we deal harshly with each other, we angrily deny each other as brothers in a common Lord even as we pray for each other must be an odious offense to Christ Himself Whom we make present. As I have come to know and love so many Orthodox Christians and have myself come out of the narrow, rigid, parochial mindset that I was raised in, as I have studied and prayed the vision that the Vatican Council has called me and my brethren in this age, this ancient rendering fills me with sorrow since it shows an age when we still were willing to work and reason together to maintain the Lord's own prayer: ut unum sint--that (they) all may be one. Peace be to all. May the Lord bless all patriarchs, religious, ministers, workers in the vineyard, laity, and all people in the world be they Christian or not. I tend to use these words as commonly understood except I use Catholic much the way Anglo-Catholics (Anglicans with Catholic beliefs) do, which may not be consistent so shoot me. When I use it it mean everybody, except for ACs themselves (! 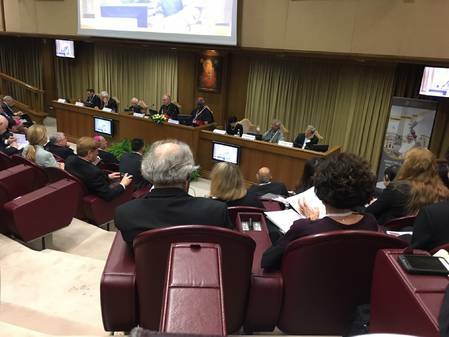 ), whose orders Rome recognises (groups Rome calls churches; criteria: very basic credal orthodoxy, so much so the Oriental communion and Assyrian churches have always passed muster, an unbroken claim to apostolic succession and uninterrupted formally orthodox teaching about the Eucharist). (Rome doesn't recognise Anglican orders; to Rome the Russian Orthodox are a church but the Anglicans are an ecclesial community, Romespeak for a Protestant non-church, just a collection of individual Christians.) Some people use apostolic that way. When I mean commonly understood Catholic I usually say Roman Catholic (sorry, Eastern Catholics) or RC; if I’m talking about Eastern Catholics I say Eastern Catholics instead, or Byzantine Catholics (or European: Greek Catholics) for all those churches, or the specific name like Ukrainian Catholics. As Fr Serge once remarked to me Maronites and Melkites don't even need the C word in this context (like Ukrainian Catholic versus Ukrainian Orthodox) as they are all under Rome. Anyway Orthodoxy in communion with Rome (OicwR) seems a school of Greek Catholic churchmanship (just like Anglo-Catholicism is in Anglicanism) popular online and among Greek Catholics by choice (converts if you will): unlatinised in church practice, just like Rome calls for, and minimising the differences with the Orthodox churches, which sometimes shades into going against Rome, like 'We don't believe in the Immaculate Conception' or even 'We don't believe the second-millennium papal claims' (and you're under Rome because?). The Greek Catholic churches with the most OicwR are the tiny Russian Greek Catholic Church and the bigger Melkite Church. 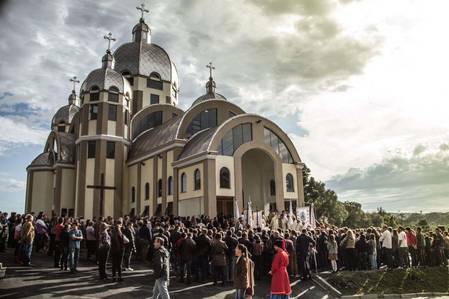 They're thin on the ground among Ukrainian and Ruthenian Catholics. A parallel: just like Anglo-Catholics don't intend to lie or to slight Roman Catholics by using the C word including without a qualifier, the OicwR aren't being dishonest (trying to pass themselves off as being in the Orthodox communion) or trying to insult the Orthodox. 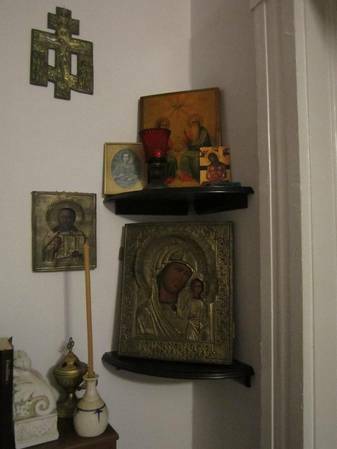 Mirror image: when I say Orthodox I mean in the Orthodox communion, under one of the Orthodox patriarchs. Most are Eastern Orthodox (using the Byzantine Rite) just like most common-meaning Catholics are RCs. As for many/most Greek Catholics, I once had a born Greek Catholic girlfriend who essentially said, 'Please don't call me an Orthodox in communion with Rome'! I generally call people what they want so OicwR and non alike are Byzantine/Greek Catholics. IMO can one really be an OicwR? Here goes. No knock on them but no. The papal claims set the two churches apart.